Limited Availability. Call for Details. Unfortunately, the Brunton RL6 5 Bright White & 1 Red LED Headlamp is no longer available. You can explore other items in the Headlamps category yourself to try and find the perfect replacement for you! 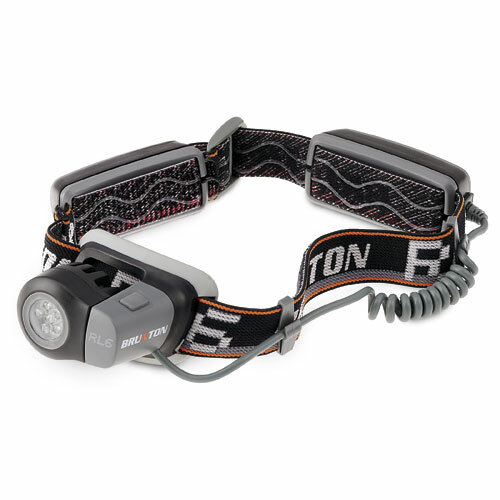 With four light modes, the Brunton RL6 headlamp offers four ultra bright LEDs plus a red LED for any use. RL6 operates on just 4 AA batteries (included) making it extremely lightweight and comfortable on the trail. Built to stand up to rough use, these headlamps are ideal for bikers and night joggers, finding a tree stand in the dark or lighting your way out of the woods at night. The RL6 model has 4 light settings to conserve on Battery. Boasting five powerful white LEDs and one red night-vision LED, the Brunton RL6 0.5-watt headlamp is a perfect accessory for hikers and spelunkers. The lamp is lightweight and comfortable to wear, with a pair of ergonomically placed battery compartments adding a minimum of extra weight. More importantly, the headlamp shines a bright light out to 72 feet, so you can see the trail clearly in front of you at all times. And thanks to the red LED, the light won't wash out your map or hurt your night vision in the midst of a dark spell. Other details include power save, bright, ultra-bright modes; an emergency flash mode should things get dicey; an anti-reflective matte finish; a continuous battery life of 85 hours on the high setting; and a water-resistant housing for inclement weather. The RL6, which weighs a mere 5 ounces, is backed by a one-year warranty. Its even ATEX certified for use in potentially explosive environments, and of course IPX6 water-resistant. This is a great Headlamp. It is very bright and comfortable to wear. I have have other lamps as we are Backpackers and this is the best.